Béhanzin (Gbêhanzin) Hossu Bowelle or the ‘King Shark‘ was one the most powerful kings in West Africa at the turn of the 19th century. 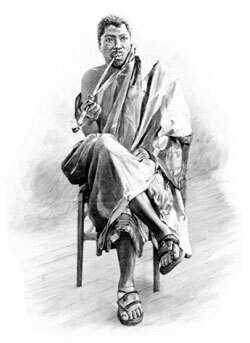 He was the eleventh king of Dahomey, and the last independent ruler of Abomey before French colonization. Who was really Béhanzin? Born in 1844 in Abomey, Béhanzin was the eleventh king of Dahomey from 1889 to 1894. His name, Kondo, was changed to Béhanzin after he succeeded to his father Glèlè. His personal symbols were the shark, the egg, and two coconut palm trees, while those of his father were the lion and the ritual knife of Gu. His name actually meant ‘the egg of the world or the son of the shark‘. His great love for the freedom of his country, culture, and people led him to courageously and fiercely defend the land of his ancestors. He led the resistance and fight for the Dahomey’s freedom. Dahomey was one of most powerful kingdoms of West Africa, deriving its power from trade and its superior army. Dahomey’s army was one of the strongest and best-organized armies in West Africa and was comprised of both men and women, including the Amazons, a superior and dreaded fighting force of female warriors. At the time, Béhanzin masterfully led an army of 15000 men and 5000 amazon women. One of the Amazon leaders was Seh-Dong Hong-Beh (which means “God speaks true“) who led an army of 6000 amazons against the Egba fortress in Abeokuta in 1851. In 1882, France declared a protectorate over Porto Novo, a vassal state of Abomey, without consulting with the indigenous people, as was (and still is) the practice with Europeans colons. By 1885, the French occupied the entire coastal strip West of Porto Novo. In 1889, King Glèlè and his son Béhanzin, who considered these coastal areas to be part of the kingdom of Dahomey, declared that the Fon people could no longer tolerate France’s actions. In February 1890, the French occupied Cotonou; Béhanzin, now king after Glèlè’s sudden death, prepared for war. Béhanzin’s army, with rifles supplied by the Germans, were getting too strong for neighboring French colonies. 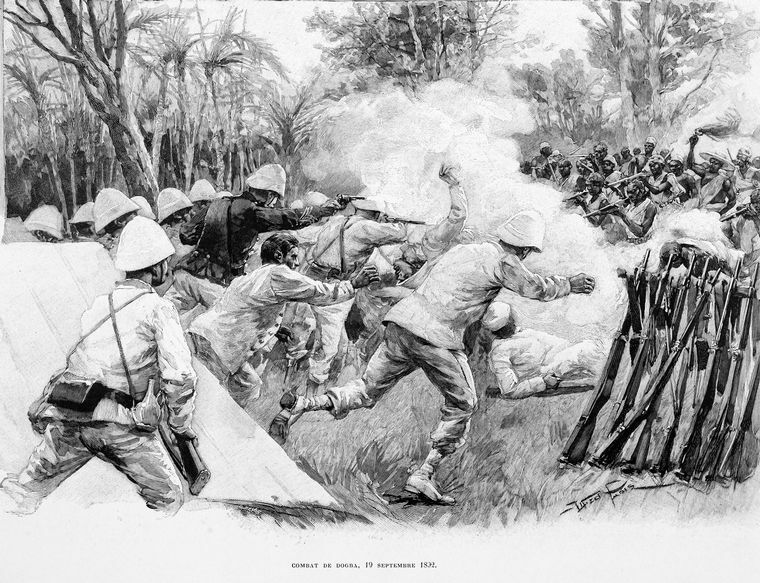 Béhanzin’s forces attacked the French simultaneously on two fronts—militarily at Cotonou and economically by destroying the palm plantations at Porto Novo. The latter precipitated an early end to the hostilities. A treaty was signed, with the French continuing to occupy Cotonou, for which Béhanzin exacted an annuity; he made France pay for the use of Cotonou port. The peace lasted for two years. However, France was determined to annex Dahomey before the British or Germans did. Béhanzin, knowing that he would have to defend his sovereignty, continued upgrading his army in preparation for renewed war. He declared a treaty made with France by his father, Glèlè, in 1868 null and void, from this war began. 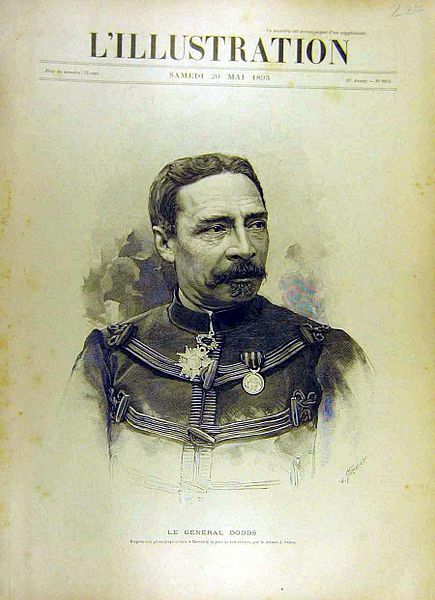 In 1894, Béhanzin was defeated by Colonel Alfred-Amédée Dodds, a Senegalese mulatto, who was sent to fight against him with powerful French armed forces. Béhanzin, not wanting his people to be massacred, surrendered his person to Dodds, without signing any instrument of national surrender or treaty. Béhanzin thought that he will get a chance to talk to the French president and find a way or sign a conciliation agreement for his country, unfortunately, the French tricked him and instead of going to France, Behanzin was exiled to Martinique. With Béhanzin and his immediate family adamantly refusing to sign a treaty making Dahomey a French protectorate, the French installed their choice, Agoli-Agbo, as king; Agoli Agbo, the puppet, did not last more than 6 years (when he asked for more freedom to rule, he was deported to Gabon). Dahomey was then placed under France’s protection and it eventually became a French colony. Béhanzin died in 1906 in Algeria. 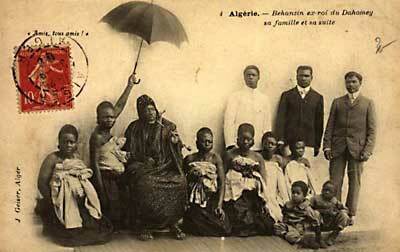 In 1928, his son, Ouanilo (who was also France’s first African attorney in 1920) had his body moved to Dahomey. Ouanilo’s remains will be restituted to Benin almost 80 years after his death. Where are now the ardent amazons who were inflamed by a mighty anger? … Who will praise their splendid sacrifices? … Who will tell about their generosity? … How could I accept any sort of abdication without them? How could I dare presenting myself to you, brave warriors, if I signed the general’s paper?… for the survival of my people, [I agree] to meet in his country, according to his promise, the president of the French]. Please watch this great documentary about the life of Béhanzin, the last king of the Dahomey (part 1 – 4), and one of the last resistant to French colonization. Why was he defeated? He said himself: «malgré la justesse de notre cause, notre vaillance et notre détermination, ils n’ont pu l’emporter et s’accaparer de la terre de nos aïeux que par la force de leur science» [despite the legitimacy of our cause, our courage, and determination, they could only win and take the land of our forefathers because of the force of their science]. Check out the website djime.com entirely dedicated to Béhanzin and his heritage. 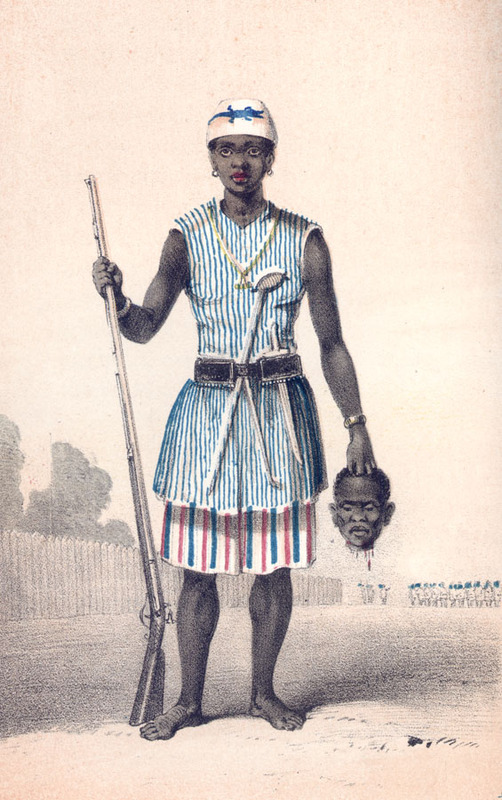 To learn more about Dahomey’s Amazons, check out the Smithsonian blog. This facebook page provides details about the organization of the amazons in the army. Don’t forget to offer your support to the Agongointo Musée du passé vivant dedicated to the kingdom of Dahomey. Great info on the Dahomeys and their fight against colonization. Thank you! Yes… I wish our countries could continue the fight the way Behanzin, or Samori did. There is so much to learn from these great warriors of the past. Fantastic, both joy and sadness. Murder and take…greed and power disguised in colonization. Smdh. I love Learning of the greatness of our people. Thanks for commenting Linda. I am indeed very happy to learn about the greatness of our people. Legend never die, thanks for the battle…! Thanks for linking to this great article on Behanzin. That was a great article. It’s good to know that there were kings doing their best to fight against colonization. I know you have issues with this movie, but the Dahomey Amazons were also a major inspiration for the female guards in Black Panther. Yes… there were an inspiration for the movie, and I know Hollywood is planning another movie particularly focusing on the Dahomey Amazons which will star Danai Gurira and Lupita Nyong’o if I am not mistaken. I see although I’m a bit confused here. Is it a period piece with the real Dahomey Amazons in Benin or is it a Black Panther side story with the Dora Milaje (I just looked up the name of the movie’s all-female squadron) since Danai Gurira and Lupita Nyong’o were both in that Marvel movie? I thought they were going to make a real piece with about the real Dahomey Amazons, but maybe I am mistaken, and it is just a side story to the Black panther guard crew led by Danai Gurira. Gotcha. I was just curious about that situation. A period piece about the real Dahomey Amazons would be great, but with the right directors and creators. Maybe Nollywood or Benin (which would give lots of credence) could give it a shot. I wouldn’t be surprised if they did a side story to the Black Panther guards given the success of that movie and with Captain Marvel being their first female solo Marvel film. Speaking of Danai Gurira, when I looked up her filmography, I realized that I saw a movie she was in that I saw a long time ago called The Visitor where she plays a Senegalese jewelry maker who emigrates to NYC with a Palestinian-Syrian dummer. I never made the connection she was in that movie and Black Panther until recently. Yes… I saw that movie with Danai Gurira too, The Visitor. It was a while back. Nice! It’s been a long time since I saw that movie. I would’ve never expected her to be an a Marvel movie when I first saw it. Yes… she has matured in a pretty good actress. Definitely. She certainly is talented. On another note, I didn’t know she was born in Grinnell, Iowa before going to Zimbabwe which is interesting because I had family members who used to live in that town and my dad graduated from Grinnell College. Small world. Haha! Yes indeed! Such a small world! Sure thing and I couldn’t even believe it. I told my dad that and he thought it was cool.